What is binaural music? Binaural Music is music that utilizes an audio technology known as "binaural beats". Binaural beats or "binaural tones" are an auditory effect that is created in the brain when two tones of slightly different frequencies are played separately into each ear. This effect was discovered in 1839 by Heinrich Wilhelm Dove and is now commonly used with great effect to create audio technology that enhances relaxation. When played with headphones, you may be able to hear the binaural beats as a subtle pulsing sound beneath the music. Binaural beats can be used to bring about desirable changes in brainwave activity, thereby helping to induce a state of deep relaxation. For example, by playing a tone of 175 Hertz into the left ear, and a tone of 180 Hertz in the right, the brain detects a frequency of 5 Hertz (the difference between the two frequencies) and is entrained towards a frequency of 5 Hertz. This technology has tremendous practical benefits for practitioners who wish to guide their listeners into a deeply relaxed state. Binaural beats cause the brain of the listener to adjust its dominant frequency to match the frequency of the binaural beat. This is what is known as the "frequency following response". It's also commonly referred to as "brainwave entrainment". Please note that binaural music is most effective when experienced through headphones so that each ear receives a specific frequency. If played on an open stereo system, the music will sound different and may not be as effective. Common uses for binaural music Binaural music is an appropriate choice whenever deep relaxation is your goal. Here are some additional ways in which binaural music may be of use to you... 1. They make fantastic background tracks for guided relaxations to cure insomnia (delta frequencies recommended for this purpose). 2. Binaural music can be of great benefit to hypnotherapists who are working with clients who are particularly resistant to relaxation. 3. Binaural music can really enhance instructional guided meditations. If you are creating guided meditations for beginner, intermediate or advanced meditation, binaural music can help to guide your listeners mind into an appropriate state of meditation. 4. Binaural music can also be used for more esoteric spiritual meditations, especially those in which very deep states of relaxation are required. Do binaural beats work? Absolutely. Binaural beats were first discovered over 150 years ago, and have been the subject of a great deal of technical exploration over the last 35 years in particular. Millions of people use binaural music to enhance their quality of life and to experience deep relaxation. In fact, binaural music technology is now used for more than just meditation. It is also used by a variety of practitioners and private users for improving self-confidence, stress relief, pain management, relaxation, improving and concentration and improving the quality of one's sleep. If you would like to read an objective third party report on binaural beats, please refer to this Wikipedia article. What binaural frequencies are used in our royalty free binaural music? The Royalty Free Brainwave Entrainment Music on this site is available with three optional binaural beat frequencies: 1. Alpha. Contains a continuous binaural beat of 10 Hertz. 2. Theta. Contains a continuous binaural beat of 5 Hertz. 3. Delta. Contains a continuous binaural beat of 2 Hertz. 4. Gamma. Contains a continuous binaural beat of 40 Hz. What's the right frequency for you? Alpha This music encourages a state of alpha relaxation. The alpha state is a pleasant state of relaxed alertness. It’s a state that many people experience when they are waking up in the morning or when they are just beginning to drift off to sleep at night. While in a state of alpha relaxation, the mind is quite clear and receptive to information, learning is accelerated and one’s sense of creativity is enhanced. The mind is also very open to positive suggestions during this state. Theta This is probably the most popular choice of frequency. The theta state is a state of tremendous stress relief. The benefits associated with theta level relaxation include improved concentration, reduced hyperactivity and improved memory. While in a state of theta relaxation, one’s blood pressure, breathing and heart rate all slow to a much more restful and healthy level that promotes natural healing. During theta relaxation one may also experience vivid flashes of mental imagery as the mind opens to memories or subconscious information that is not available to the conscious mind during the normal waking state. The theta state is a very deep state of relaxation that is excellent for deep hypnosis and mental programming. Delta This music encourages a state of delta relaxation. Delta brainwaves are most prevalent during deep, dreamless sleep. The delta state is a mostly unconscious state that is essential to one’s physical, emotional, psychological and spiritual wellbeing. People who are able to achieve a state of delta relaxation through meditation will sometimes describe spiritual encounters and out of body experiences. The delta state is perfect for inducing profound spiritual experiences, healing and deep subconscious repatterning. Delta frequency brainwave entrainment music is also a fantastic cure for insomnia. Gamma Gamma waves are the fastest brainwave frequency range. Gamma brain waves are believed to link and process information from all other parts of the brain. A high amount of gamma wave activity in the brain is associated with intelligence, compassion, focus and feelings of happiness. High levels of gamma brain waves have also been linked to improved memory and an increased sensitivity to sensory input. Low amounts of gamma brainwave activity have been linked to learning difficulties, poor memory and impaired mental processing. Please click here to browse examples of our royalty free binaural music. When it comes to the subjects of hypnosis music, the principles of psychoacoustics leap to the front of my mind. These are the principles that I take into account whenever I compose therapeutic music for hypnosis or meditation. You may already know a lot about psychoacoustics without even realizing it. This article will help to clarify some of the science behind what you already know on an intuitive level and it will give you some great insight into what types of music work best for relaxation and hypnotic induction. psy•cho•acous•tic / adjective "A branch of science dealing with the perception of hearing and sensations produced by sound". In other words, psychoacoustics is the study of the ways in which sound affects you emotionally, physically and mentally. You could think of it as a form of music psychology. Even though psychoacoustics is a science, I won't be bogging you down with charts and graphs on this page and I certainly don’t want to give you the impression that hypnosis music is something that can be neatly summarized by a set of scientific principles! First and foremost, music is an art form. Science can help us to understand, on an intellectual level, how and why human beings respond to music as they do, but science can never fully explain the magic of music any more than the science of cardiology can explain the mystery of love. Helen Keller put it in her own special way when she said: "The most beautiful things in the world cannot be seen or even touched, they must be felt with the heart." When it comes to creative endeavors like music composition, we must always leave some room for intangible factors – intuition and inspiration will always play a part and will sometimes give rise to music that defies the dictates of logic. “Sonic mantra” is the phrase that I use to describe repetitive sounds that are used in place of a traditional meditation mantra. These sounds could be as simple as a metronome’s tick, or better still, they can be musically expressive – a repeating series of notes for example. Music example: Deep Within [audio mp3="https://royaltyfreehypnosismusic.com/wp-content/uploads/2017/01/Deep-Within-Preview.mp3"][/audio] As long as they are tonally pleasing, repetitive sounds can really help to lull the mind of the listener into a state of deep relaxation and they are wonderful for hypnosis or meditation. Music that contains Sonic Mantras is what I sometimes call “true” meditation music, because it embraces the time-honoured technique of using mantras to induce a state of deep relaxation. Goodness – what a dull sounding word! Sure enough, the idea of drones might sound a bit uninspiring to you at first, but drone sounds can be deeply relaxing and are fantastic for inducing states of deep relaxation and sleep. What are drones? Drones include any sound that is: 1. Unbroken - the sound does not stop and start, and 2. Relatively unchanging in pitch. A classic example of a drone-like sound that has been used for meditation for thousands of years is the sound of the “Om” mantra. Music Example: Om Mantra [audio mp3="https://royaltyfreehypnosismusic.com/wp-content/uploads/2017/01/Om-Mantra-Preview.mp3"][/audio] Drone sounds usually have no melody, and they have no discernable tempo, but they do have other important qualities that must be musically pleasing. For example, drones often have a texture that can be described with words like "smooth", "fine", "soft" or "coarse", and a timbre that can be described with words like "celestial", "warm" or "complex" just to name a few. The pitch of a drone must not be too high or the drone may become shrill and tiring, and it must not be too low or the drone may become aurally opressive and even imperceptible on some stereo systems. A drone may also be comprised of many layers of sounds, and when these sounds harmonize with each other they become deeply hypnotic and most pleasurable to listen to. Sometimes this effect is very subtle, but when it comes together well the result is sublime. Like a fine wine, drones can be complex, multi layered and immensely satisfying. I personally am a huge fan of drone music and use it often during my own meditation practice. I have also received a great deal of positive feedback from hypnotherapists who have used my drone music during live sessions and in hypnosis CD productions. Drones can be listened to "raw", or they can be used to provide a hypnotic foundation to a piece of music that contains other elements such as chimes, nature sounds or instrumentation. Here is just one example: Music Example: Ascension [audio mp3="https://royaltyfreehypnosismusic.com/wp-content/uploads/2017/01/Ascension-Preview.mp3"][/audio] When it comes to music for inducing states of meditation and hypnosis, drones can extremely useful. They tend to envelop the listeners awareness in a very gentle way, especially when played on headphones. Drones seem to fill up the space in your mind and wash away thoughts with their constant, soothing tones. Unlike music that is melodic and dynamic, drones will not overstimulate your mind or distract you while you are in the deepest states of relaxation. Since the dawn of time, we have been graced with the wonderful sounds of Mother Nature. It’s only been during the last few decades or so that man-made music has become commonplace…and along with it has come all the noise and cacophony of modern industry and media. We have become cut off from the sounds of our natural environment, and bombarded by sounds that cause stress. Listening to the sounds of nature reminds us that we are a part of a greater whole. The sound of birds in the morning, the sound of crickets in the evening…these are just some of the sounds that remind us that our life extends beyond the walls that surround us at our home or office. The ebb and flow of waves on a beach, the sound of wind in the trees…these soothing sounds are innately peaceful and have a purity about them that most of us have become disconnected from. Just as some aromas can trigger memories, the sounds of nature can trigger a biological memory within us that reminds us that we are a part of nature itself. Nature sounds can be used to great effect in many types of relaxation music, especially when they are used to add atmosphere or to emphasize a guided visualization that involves natural scenery. When it comes to music for hypnosis, nature sounds may be included, but care must be taken not to add sounds that might be distracting. For example, sporadic bird sounds might be an irritation for some listeners, especially if they are played too loudly. On the other hand, the repetitive sound of a cricket’s chirping can be used like a metronome to add a hypnotic element to the music. Again, care needs to be taken to manage the volume and tonality of these sounds so that they are soothing, and never shrill or aurally fatiguing. White noise has a special role to play when it comes to relaxation, but it is often overlooked as a sound-source for inducing altered states of consciousness. Just as white light is the aggregation of all visible light frequencies, white noise is the sound that is produced when all possible sound frequencies are played at once. It is a pitch-less drone sound. When you think of white noise, you probably think of the nasty hissing sound that comes from your TV or radio when it’s not properly tuned in. In its raw form it sounds like this: Caution: Play Quietly! [audio mp3="https://royaltyfreehypnosismusic.com/wp-content/uploads/2017/01/White-Noise-Sample.mp3"][/audio] Sounds a bit nasty doesn’t it? That’s white noise all right, but it’s just one type of white noise. The sound of ocean waves – that’s white noise. So is the sound of rain, the sound of wind and the sound of your hairdryer. These are all forms of pitch-less sound that we can categorize as white noise. Raw white noise can be manipulated – sculpted if you will – to create sounds that are deeply hypnotic. By reducing certain frequencies and modulating the tonality of the white noise over time, raw white noise can be transformed into very soothing sounds that can be quite soporific. Like this for example: Music Example: Constellation [audio mp3="https://royaltyfreehypnosismusic.com/wp-content/uploads/2017/01/Constellation-Preview.mp3"][/audio] White noise sounds help to absorb the attention of the listener, but without stimulating any particular emotional response. White noise recordings have some very practical real world applications. For example, white noise is wonderful for masking background noises, and so many people use white noise as a sleep aid, or to drown out distracting sounds so that they can concentrate on a specific task. White noise can also be used to enhance meditation, to relieve tinnitus, to cure insomnia, and even to prevent eavesdroppers from listening in on private conversations! Studies have shown that the tempo of a piece of music can have an effect on the respiration rate and heart rate of the listener – a fact that with important implications when it comes to music for hypnosis. However, I think it is worth mentioning that the importance of tempo is sometimes overstated. I’ve come across numerous websites that boldly claim that "60 beats per minute is the perfect tempo" and that anything other than this particular tempo is unsuitable for hypnosis. I get the impression that this assertion is a flimsy attempt to assert a point of difference; more a marketing tactic than real fact. In most cases the tempo of any music that you use for hypnosis should be less than 70 beats per minute. Most of the music that I compose will usually fall somewhere between 48 and 65 beats per minute. However, some music has no discernable tempo whatsoever, and in these cases tempo is irrelevant! Drone music is a great example of this. Relaxing new age music is famous for being laden with bell sounds, chimes and bell-like instruments such as electric pianos. These sorts of sounds sure do add plenty of atmosphere to music, whether they are used instrumentally, or as an occasional feature sound. However, bells can be distracting to some listeners once a deep state of relaxation has been reached. This occurs for two reasons: 1. Bells (and bell like instruments – even pianos fall into this category) have a short "attack time", meaning that the sound they make is emitted almost instantly when played. The sudden, percussive nature of bell sounds can be a little intrusive. 2. Bells can be quite shrill and inharmonic, depending on the type of bell that is struck. These issues are usually not a problem during hypnosis, so long as the composer has been careful to manage the volume and tonality of the sounds that he or she has used. Hypnosis and Music Therapy - It's Deep Stuff! Unless you are fortunate enough to have the equipment and technical skills necessary to record your own voice, you’ll need to organize a trip to a recording studio. Most recording studios charge by the hour, so it goes without saying that the more organized you are, the less time (and money) you’ll spend on studio fees. What do I mean when I say “organized”? Well there are a few things you can do to ensure that the recording process is smooth, efficient and enjoyable... 1. Bring along 2 or 3 copies of your script. There is a chance that the recording engineer will want to read the script while you are speaking it to make sure that you don't miss any lines. He or she may also need a copy on hand if your voiceover recording requires some audio editing. 2. Rehearse your hypnosis script a few times before you go to the studio, and you’ll feel more relaxed and comfortable about speaking it in front of a microphone. 3. If possible, decide on what hypnosis background music you want to use in your recording BEFORE you visit the studio. There are two reasons why this is important: Reason 1. If you can present your background music to the recording engineer on the same day you record your voice, then there is a good chance that he or she will be able to blend your voiceover with the music and complete the production of your recording right then and there. This means you may save time and money and avoid repeated trips to the studio. Reason 2. If you have chosen the background music you want, and if you have it with you when you visit the studio, then you can listen to it while you record your voiceover. This can really help to put you in the right frame of mind while you are speaking, and it can really help to improve the synergy between your words and the music. Tips on choosing a recording studio Some of the therapists I speak to are fussy about where they record...for example, they don’t want to record a guided relaxation in a space that was occupied by a heavy metal band earlier that day! The internet is the best way for you to research recording studios in your area. Many studios focus on recording bands, but there are studios that also specialize in voiceover recordings. A little online research will steer you in the right direction, but if you are still unsure, don’t hesitate to ask studios if they have any experience recording voiceover productions. More and more people are competent with computers and recording techniques these days, and it’s possible that you know someone who has a home recording studio. Perhaps you’ve asked them if they can help you, or perhaps they have offered their assistance. Recording with a friend will probably be more comfortable and cheaper than going to a studio, but if you intend to sell your recording then you must ensure that the person you are working with has a suitable level of technical skill and good quality recording equipment. Obviously this can be a little hard to asses, but as a rough guideline, the minimum requirements for recording at home include: 1. A (very) quiet recording space. 2. A good quality microphone. 3. Knowledge of correct vocal recording techniques. 4. The ability to mix your vocals with your music and to produce a properly mastered audio file. Tactfully ask your friend if they can answer "yes" to these requirements. 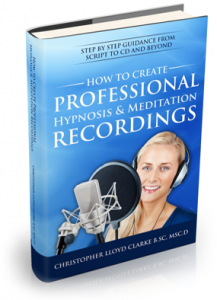 If they can, then you may well be able to record your hypnosis production in the familiar comfort of a home recording studio. Recording your own voiceover and blending it with music to create a professional recording can be quite a complicated procedure, especially if you have no previous experience. To be successful at this, you'll need to have: 1. A (very) quiet recording space. 2. A good quality microphone (a large diaphragm condenser microphone is one of the most common types that voiceover artists use). 3. Sound recording software. 4. Good microphone technique. 5. A microphone "windshield" - a device that shields your microphone from small blast of air from your mouth while you are speaking. 6. The ability to mix your vocals with your music and to produce a properly mastered audio file using your sound recording software. While it is beyond the scope of this article to provide complete instructions on how to accomplish all of this, I can recommend a few resources that may be of assistance to you. Windows Audacity - Audacity is a popular free audio editor. You can record sounds, play sounds, and import and export a variety of different audio formats. Audacity isn't the prettiest audio program in the world, but it will do everything you need to create a professional audio production. Sony Sound Forge Audio Studio - An affordable and very well featured sound editing application. Sound Forge™ Audio Studio will allow you to record, edit and master professional-quality audio on your home computer. Free trial. Macintosh New Macs come with a free program called "Garageband". This user friendly program allows you to you record your voice, mix it with the music of your choice and then master your own recording. Alternative programs include: Audacity - Audacity is a popular free audio editor. You can record sounds, play sounds, and import and export a variety of different audio formats. Bias Peak LE - An excellent audio editor for Macintosh. Bias Peak LE is based upon Bias Peak Pro, a more expensive professional audio tool. Peak LE combines pro-quality recording, precision editing, creative effects processing, podcast publishing, and Red Book CD burning. Professional Quality Microphones Sure Microphones are a trusted brand that offer a wide variety of mics at reasonable prices. Check out their USB mics for a simpler recording solution. Rode Microphones produce excellent quality, excellent value microphones. Their NT1-A microphone is a great option for anyone wanting to record high quality voiceovers. AKG are another trusted brand that now offer USB microphones at very reasonable prices.